Directed and written by Alex Garland. Produced by Andrew Macdonald and Scott Rudin. Release date: April 10, 2015 (April 24, 2015 expansion). If you don't immediately recognize the name "Alex Garland," you're not alone. Screenwriters usually don't get recognized unless they're Aaron Sorkin or something. Garland, if you don't know, wrote the screenplays for 28 Days Later, Never Let Me Go, Dredd, and Sunshine. Videogame players might recognize him for co-writing the story to Enslaved: Odyssey to the West. If you don't know who he is, now is the time to get acquainted with his work. He makes his directorial debut with Ex Machina, immediately establishing himself as a director to watch. We don't get smart, thrilling science fiction movies particularly often. Ex Machina is one of these. It starts off with a fairly simple premise, builds an incredible sense of atmosphere, and then ends perfectly. It makes us think both while it's playing and after it's concluded. I took several days after watching Ex Machina in hopes that I would find something I disliked, but I couldn't find anything. It's about as close to a perfect movie as one can get. The story is pretty basic, at least at the beginning. A computer programmer, Caleb (Domhnall Gleeson), wins a contest to spend a week at the house of his company's reclusive CEO, Nathan (Oscar Isaac). Upon arriving, Nathan reveals that Caleb is here to perform a Turing test on an A.I. he has created. Caleb will test the A.I., named "Ava" (Alicia Vikander), and try to determine if he'd be able to tell that it wasn't a human. But, soon enough, Ava reveals that Nathan may not be telling him the whole truth. This idea is introduced early and allowed to fester; it isn't hammered home until later. Ava and Caleb grow close together, too. You can probably see, at least in part, where this is going. Caleb is torn between his human brethren and Ava. Whether Ava has consciousness comes into focus. The concept of identity is questioned. And those questions only serve as the beginning of the thought-provoking ideas the film has you contemplate. By the end of Ex Machina, you're exhausted, mentally, because it begs you to think about it more than the vast majority of movies you watch. 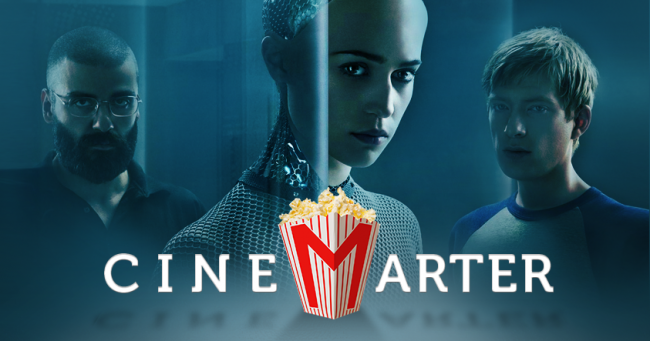 You're not conditioned for a movie like Ex Machina, and as a result it feels special.